1838 Soldier's Entire "From A. Hutchin QRM Sgs D 72d Regt" from Paisley to Bannockburn correctly endorsed. Manuscript 'P1' in red. 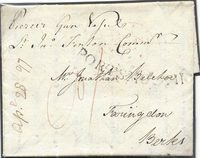 1811 Soldier's Concession Rate Entire from Edinburgh to Wemyss "From Serg Major Bolton/District Staff Edinr" and countersigned by the Commandng Officer, MS "P 1" in red. 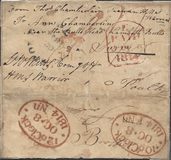 1814 SAILOR'S LETTER "from Wm Chamberlain seaman/H.M.S Horatio Sheerness", countersigned on the reverse contrary to regulations. Manuscript '1' in Red addressed to Lambeth being transferred to the 2d Post but no charge payable showing 'crown/To be/delivered/Free'. 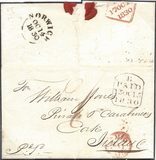 1812 6 May Soldier's Letter addressed to Haddington incorrectly made out with the name of the sender "Sgt Ballantyne, Armourer 1st Militia" and with the name of commanding officer above the address. Despite this, it was accepted as a Soldier's Letter and prepaid 1d. Ex Jay. 1832 SOLDIERS ENTIRE headed "ABERDEEN BARRACKS", "From John Gunn QM Sergeant Depot 72d Regiment" to Bannockburn and correctly endorsed MS 'P1' in Red.